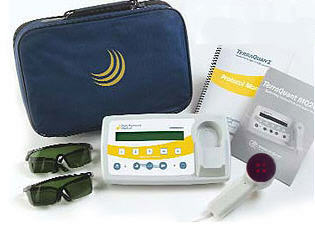 The LS-50 package features the TerraQuant console with an LS-50 handheld emitter. This product is a big step up from the TerraQuant Pro package because it includes the LS-50 emitter which incorporates four (4) super pulsed GaAs diodes with 50,000 mW of power in a larger 3.5 square inch array. The 3.5 square inches of coverage area is 5 times greater than the standard SE-25 emitter and the larger treatment area works better with unattended treatments. The additional power and coverage of the LS-50 emitter cuts therapy times by over 50% while increasing the depth of penetration. LS-50 Cold Laser Package is a great choice for professionals because has the highest power density of any TerraQuant product and it allows for the addition of a second emitter in the future. 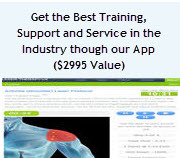 Combine this product with the DX-2 cart project the most professional image to your patients. The LS-50 handheld emitter completes the LS-50 TerraQuant system. The emitter incorporates four (4) super pulsed GaAs diodes. The 3.5 square inches of emitter area can cover 5 times more area than the standard SE-25 emitter. This emitter is ideal for stimulating greater systemic effects and for treating the spine or large muscle groups. The LS-50 emitter is not compatible with the PS-4 probe set. SE25 25 Watt Emitter TerraQuant console comes equipped with two emitter ports. This gives you the ability to upgrade your TerraQuantï¿½ laser to a dual emitter system when you see fit. The Terraquant LS-50 Cold Laser System is unlike any other laser system on the market today. In addition to being FDA cleared, this product delivers exceptional power and coverage area to accelerate treatment and increase the chance to hitting the target.